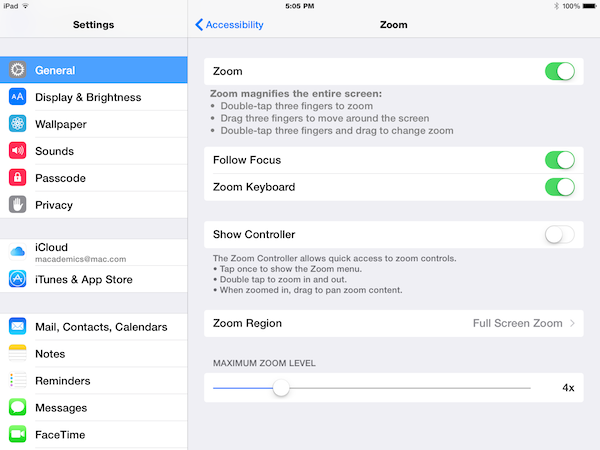 Settings > General > Accessibility. 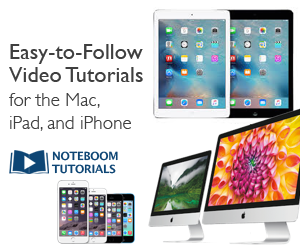 I’ve used the iPad zoom function in hundreds of iPad sessions. For the last few months, I’ve had trouble with it. I suspect the trouble began with an update to iOS 8. Here’s the problem. Though I clearly selected Full Screen Zoom under zoom region, the iPad would occasionally and mysteriously switch to a window zoom. Window zoom is like a rectangular magnifying glass overlaid on the screen. Any screen content under the magnifier lens is enlarged. This is how Window Zoom is supposed to work, but this is clearly not what I wanted. I’d fix the problem by jumping into settings, switching zoom off, then on again. However, this interrupted the flow of the lesson and often caused curious stares as I paused to remedy the problem. So I did a bit of web sleuthing and discovered a solution that seems to work. The trick is to turn Zoom Keyboard ON. Under iOS 7 we didn’t have this keyboard on/off option with zoom. Leaving the keyboard unzoomed keeps your content zoomed, but the keyboard stays the same size while typing. This can be a handy feature when composing text, but not when full screen zoom is what you really want. Presentation tip: When tapping with three fingers to activate full screen zoom, tap on the area of the display you want to enlarge, not in the middle of the screen. Then you may not need to drag three fingers around to get to the intended part of the screen. Seems obvious, but I missed this when I first started using the zoom function.